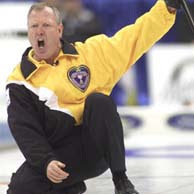 We're going to the Brier tomorrow morning! How can you not go to the Brier when it's being held in your hometown this year, when all that hurrying hard and whoaing is going on not a half hour drive from your house? The game on sheet A is going to kill me, as it is my two favourite teams playing each other. How will I decide for whom to cheer? Newfoundland & Labrador is a great young team, fun to watch and Olympic Gold medalists, but the Manitoba rink curls out of the Charleswood Curling Club in Winnipeg, right next door to my old high school. Charleswood represent! And since neither the Spousal Unit nor I have ever been to a Brier before, we may pop into the infamous Brier Patch for a quick lunch and a wee nip after the curling. I just hope we don't get ambushed by the Morning Class, who are a bunch of Thunder Bay senior citizens who have been forcing gin collinses on innocent victims for the past 48 Briers. At 7:30 in the morning. I'm planning to stick to Tim Hortons coffee myself. Labels: curling as a metaphor for life, is my Canadianity showing? How exciting! My friend and fellow curler is off to the Brier, too, and she's totally stoked! You're going to have so much fun. I didn't appreciate curling until I played once, and now I get a kick out of watching the big tournaments. Oh, you're talking about curling. I thought this was going to be a naughty post, based on "rim rolling." Go Newfoundland and Labrador! Did I ever tell you that when they were shooting their Olympic game, the province closed all the schools for the afternoon so people could go home and watch the game? It was pretty sweet support. Dang, you Canadians are so cool. Next thing ya know you're going to be going to see a broom ball tournament. You're a curler, Wandering Coyote? I probably should have known that. I can well understand why your friend is stoked about this. Lots to tell, Al! It really is athletic chess on ice and the audience is beautiful to watch as well. It must be your Gran's genes coming to the forefront that explains your love of curling, Kees. It's a Canadian law. We did some curling in high school gym and I've been in a few bonspiels since then, Mr Anchovy. I think it does give me an appreciation of how hard it actually is to curl well. We only do wholesome rim rolling on this side of the 49th parallel, Beckeye. No! You never mentioned that, John, but how exceedingly cool is that? We were talking about you today though, when Yukon/NWT just shellacked BC. It is a bit snookerish, Gifted, you are absolutely right. I can't believe how cheap these seats were (compared to a Flames hockey game). Great morning! I used to play broom ball in grad school, Justrun. It's another one of those great sports, like badminton, which anybody can play. I'm envious. I've wanted to go to the Brier for a long time but haven't managed it yet. Brier attendance should almost be required before one gets a Canuck passport. I tried curling in my high school outdoor ed class and lets just say that I'd rather hike up a mountain with a 40 pound pack on my back then do it again. Much harder than it looks. I'd love to share your excitement, but I just can't. To me, curling is like a cross between bowling and very aggressive housecleaning. Ah, always fond memories of Tim Hortons. I'm actually a little surprised curling has not become our national sport. That lacrosse business is hogwash! Who plays lacrosse? I digress. I'm going to start lobbying for curling to become our new national sport. It's one of the few sports that actually seems to improve with more drinking. Not to mention all that euphemism fun those dirty Scotsmen injected into the small print. That makes you cool, Wandering Coyote. It almost should be, Remi. We could get a stamp on our passport for each Brier. Or maybe a tattoo in our ear. It is harder than it looks, UB, but it's really the only sport where you can drink WHILE playing. What's not to love? That's one way of looking at it, SME, although a little less romantic than athletic chess on ice. You closet Canadian, you, Leazwell! Oh yes, let's blame it all on the Scots, Sean! Now lacrosse is a fine fast game, but you could put an eye out playing that. Much less so with curling. You start a petition and I will sign it. LOL Am not one for curling, but your excitement is palpable! Hope you have a great exciting time. Back in the day, I would have been drinking when the Brier Patch opened, Maureen. I am old now, though, and am actually there for the curling. Sad, I know. It was pretty awesome, BJ. I know I will be going through Brier withdrawal shortly. guess what I did first thing this morning? how green is my monkey? but how would he fare in a zombie apocalypse? no time to write a post?